Thank you for a totally “believable” written piece. I felt that I was in the chair having a crown replacement by Dr. Krowne, and I didn’t mind it so much because of Ken’s caring. You described each step in such detail that I saw and experienced what you were going through. I was relieved when your dental procedure was over, and that you could go on with your day! Thank God for Ken’s empathy and excellent listening skills, which made the procedure as comfortable as possible for you! We need to have more Dr. Krownes trained in dental school to have his gentle bedside manner. Hopefully, dentists-in-training are learning how to cultivate these vital personality qualities to lessen or alleviate common dental anxiety. Why not have our dentist feel less intimidating and more like a friend! Bev, empathy, indeed, makes all the difference. It is possible to show empathy and run the drill ( so to speak) as my story shows. I hope that dental programs include awareness of empathy and appreciation of history in their teaching. 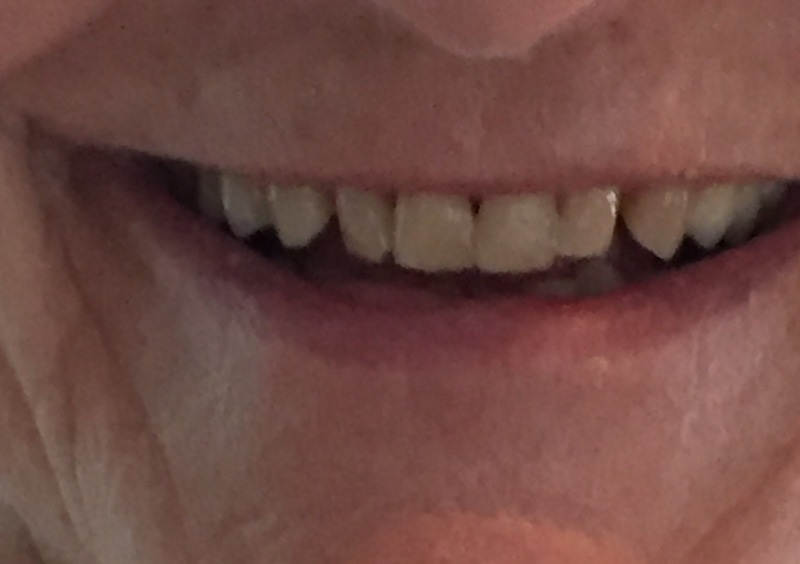 Yes grateful too that I have almost all my teeth, but envious of the younger generations who had fluorid treatments and have no fillings, like my daughter! Grateful too that I’ve have a wonderful dentist for the past 35 yrs. Pat, it is amazing how the advances in tooth care have made such a difference in our children and grandchildren’s experience. Keep flossing! Love the picture of your teeth and smile. Glad the teeth travails are manageable. You got a terrific dentist. How fortunate we are to have the teeth we have at our age. I say let’s keep chewing! 🙂 Yes, let’s keep chewing! Many thanks, Hy.